In the current paper we present the design process of an intrinsically integrated educational game on Newtonian mechanics. 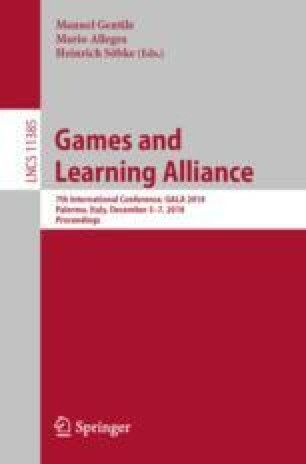 The design is based on a guiding frame in line with the intrinsic integration theory, which states that in a game, learning goal and game goal should be aligned. This also results in an alignment between a pedagogical approach and game mechanics. Our findings suggest three guidelines within this guiding frame. First, the guiding frame works in a specific order starting with forming a learning goal and ending with the game goal. Also, to optimize the alignment between the learning goal and the game goal, it should only be possible for players to reach the game goal when the desired learning goal is reached. Finally, during the iterations of the design process the focus is on aligning the pedagogical approach with the game mechanics. This proved to be an essential but difficult step. The authors gratefully acknowledge the fruitful discussions with Dr. Nico Rutten. The present paper was made possible by funding from the Dutch Ministry of Education, Culture and Science, OCW/PromoDoc/1065001.